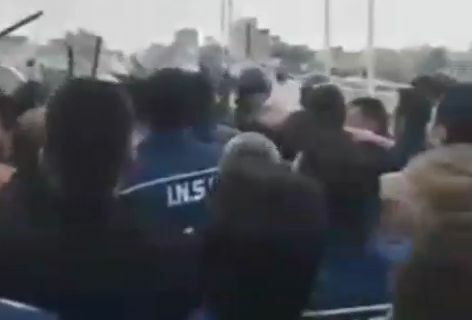 On the fifteenth day of their latest strike the workers of Iran National Steel Industrial Group (INSIG) protested in front of the Khuzestan Provincial Government HQ in Ahvaz. The strike began on November 10th and is the latest stage in the struggle of around 4000 steelworkers to have their back wages paid. Just in 2018 the steelworkers have been on strike and held street protests in February, March, June and August. The Iranian regime has dealt with them very harshly: beating them up, arresting and jailing more than forty. But the workers have not been deterred and protested together with the Haft Tappeh workers earlier this month, chanting “Steel, Haft Tappeh, united workers!” in front of Shush County Hall. Today they chanted “We’ll stand, we’ll die, we’ll get our rights!” and “Government, mafia, congratulations on your linking up!” among other slogans.